Speaker of the Armenian National Assembly the Hon. Hovik Abrahamyan meets with the President of the European Parliament Martin Schulz. The fruitful visit of the Armenian delegation to Brussels headed by the Hon. 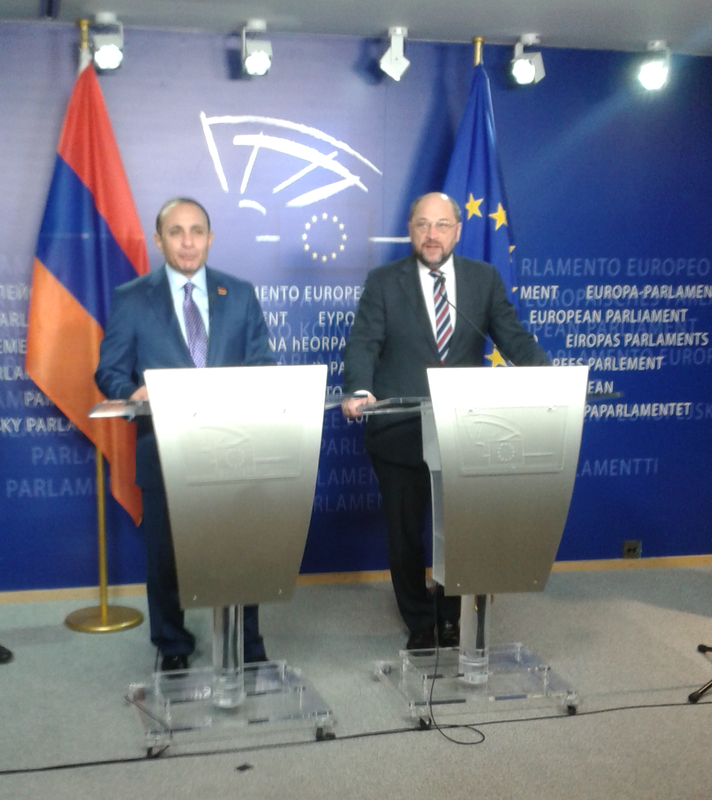 Hovik Abrahamyan has added positive momentum towards the further development of EU-Armenia relations in 2013. During Mr Abrahamyan’s visit, his involvement in activities within the European Parliament was well appreciated. On Wednesday the 9th of January he bore witness to the inauguration of the EU-Armenia friendship group and gave the welcoming address to a filled room of Brussels and Yerevan based professionals and a collection of MEPs. The group, established by Dr Eleni Theocharous, Christian Democrat MEP for the island of Cyprus, is dedicated to enhancing EU-Armenia relations within the European Parliament. On Thursday the 10th Mr Abrahamyan met with Martin Schulz, the President of the European Parliament, to engage in a discussion regarding EU-Armenian cooperation for the upcoming year. During the meeting with Martin Schulz a number of different topics were discussed, such as the Armenian elections, the ongoing dispute over Nagorno Karabakh and future economic cooperation in the context of the upcoming conclusion of the EU-Armenia Association Agreement. Martin Schulz called it a “friendly and open-minded discussion” and a mutually beneficial exchange of views.